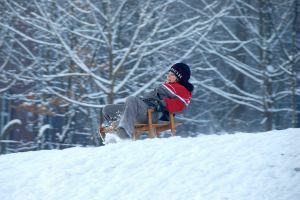 After all the snow were are getting in the Greater Boston Area this winter, many families are buying or making a sled and heading to a local hill to have some fun. However, according to a recent news article from the Boston Globe, parents should be putting a helmet on their children before sending them down the hill. While parents often make sure to bundle their kids up so much they can barely move their arms, a helmet is rarely considered when sending a child out sledding. While years ago it was perfectly acceptable to send your child down the ski slopes without a helmet, these days it is rare to see a child not wearing a ski helmet. In sledding, however, helmets are a rarely worn, and this is troubling because a person on a sled is traveling at high rate of speed, often around trees or cars, and has far less control than he or she would on skis or a snowboard. As the article points outs, bike helmets have also gone from hardly seen to absolutely necessary safety equipment for both child and adult riders. Boston personal injury attorneys all too often have seen serious accidents involving fractures and traumatic brain injury (TBI), which could have been avoided had victim been wearing a helmet. Whether it is a bike helmet or a ski or snowboard helmet, having adequate protection will significantly reduce the risk of serious personal injury. This is not to say you should essentially put your child in some kind of protective bubble and not let them have any fun, but there are reasonable steps that can be taken to help insure what started as a fun day in the snow doesn’t end with a visit to the emergency room. To further put the importance of wearing a helmet into perspective, statistics show there are over 160,000 visits to emergency rooms or doctors as a result of sledding and tubing accidents, which account for around $4 billion in medical bills and related expenses in any given year. While it easy to take this advice and put a helmet on our children when we are with them on the hill, what happens when they are at camp or anther childcare program trusted with protecting children? We can do some investigation and ask questions before choosing a particular care provider, but ultimately we can only hope they are doing what is necessary to keep our children safe. If your child was in the care of an agency or other childcare provider and is seriously injured, you may have a case for filing a negligence lawsuit. In the case of serious head injuries, medical costs may be astonishing, and in the case of a TBI, there may be high costs associated with managed care for the rest of a victim’s life. You should speak with your personal injury attorney about these concerns and make sure he or she has experience representing parents of seriously injured children. You need someone on your side fighting for your rights to a full and appropriate financial recovery.